Zohra El Yakoubi, 48, was married on January 24th, 1989, three months before her husband was taken. “I think he was arrested because he was religious and people were campaigning against the beard and short pants that prophet Mohamed wore. We kept hearing stories of men being “picked up” and he was harassed at the mosque by security officers. My husband used to work at a factory that made flour; he was an electric engineer. Someone at the factory told me that men with guns came one day and took him. A friend of ours tried to break him loose but it wasn’t possible for him to help. So many men were taken during this time. For two years we didn't know anything. I started joining protests where we were beaten with sticks. One day Abdullah Senussi read off a list of men in prison and he was on the list. He told us we could go visit our husbands, sons and brothers but we never saw them. My husband learned karate abroad and when men were released from prison they told me that my husband was teaching men karate in prison. I had a son and wasn’t able to work; many people helped me out during that time. I had to stay with my mother in law. I used to live very close to Abu Salim prison and we heard everything that happened that night; explosions, ambulances and gunshots. Everyone in the area knew something had happened. We felt in our hearts that night that they had killed him. We lived through some very morbid times. After that night friends and relatives came by, almost to pay their respect. I never saw my husband once and never spoke to him again. In 2007 the regime started pressuring me to take reimbursement money. For men who were married, their wives received 130,000 Libyan dinars and for single men, their parents received 120,000 Libyan dinars. We received his death certificate in 2008 because we kept demanding to know what happened. I always had doubts but this was confirmation of his death and it was still a shock. I didn’t get remarried; I wanted to stay single for my son. These were the cards that I was dealt and I have accepted them. The day that Gaddafi was killed I felt a huge weight lifted off of me. 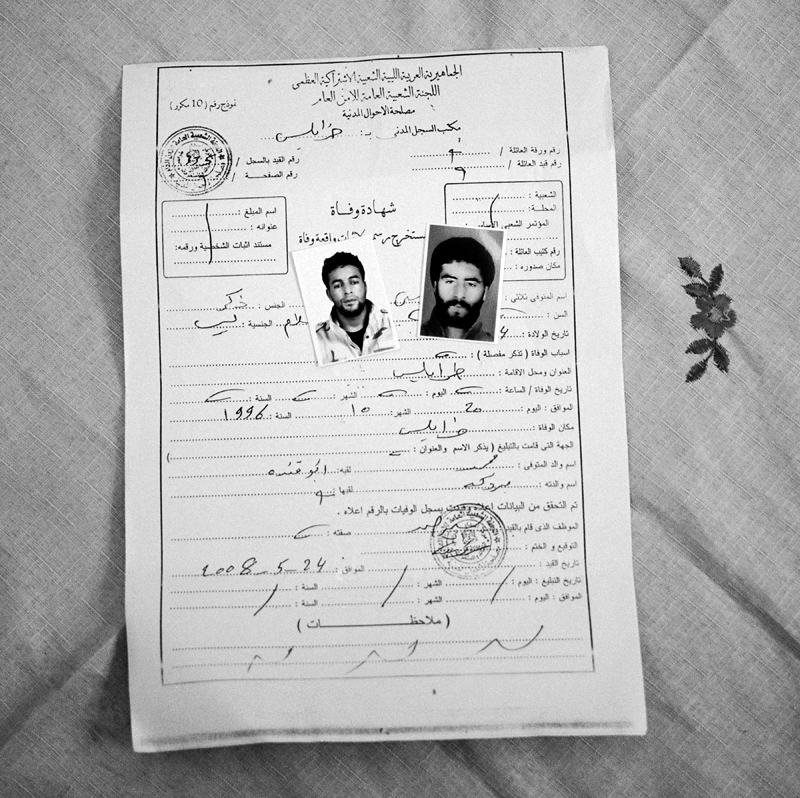 I was not stingy with the revolution; I gave it my most precious possession, my son.” Zohra's husbands death certificate accompanied by photos of her son (right) and husband (left) at her house in Tripoli, Libya on July 23rd, 2012.